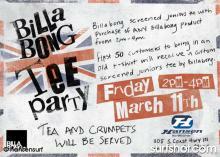 Come to the shop between 2 pm and 4 pm today for some fun with the Billabong crew. See flyer from more details. Really nice day and should be fun! Contact Headline Graphics at 760.436.0133 orwww.HeadlineGraphics.com Photocloth Surfboard printing – Get photographic quality and detail that cannot be achieved by airbrushing. Just supply us with a photograph, original art, scans or slides of artwork.